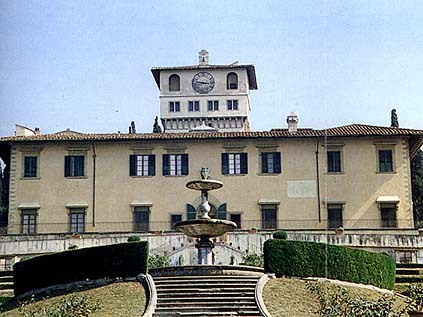 Formerly a castle of the Brunelleschi family, in 1575 it passed to Cardinal Ferdinando de' Medici who had Buontalenti completely renovate the structure. Of particular effect is the great entrance court: covered with a glass skylight in the nineteenth century so it could serve as a ball room, it houses a series of frescoes by Volterrano (I 7th cent.) depicting the pomp of the house of Medici. Elected as his summer residence by Victor Emmanuel II, the villa still has richly furnished period rooms (a curious collection of parlor games is also on view). 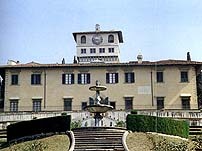 The building overlooks an Italian-style garden laid out by Tribolo, who also designed the famous fountain of "Fiorenza emerging from the water" sculptured by Giambologna. Nurseries, hothouses and basins are scattered throughout the "terraces", with their geometrically patterned boxwood hedges. The spacious English park stretches between the villa of the Petraia and that of Castello, and is characterized by its dense groves of holm-oaks, cedars, pines, plane trees, conceived by the Bohemian landscapist J. Fritsch, for the Lorraines.